Cal is a 1984 adaptation of a Bernard Mac Laverty novel directed by Pat O’Connor (The Ballroom of Romance, A Month in the Country, Circle of Friends and Dancing at Lughnasa) and starring John Lynch, Helen Mirren and Donal McCann. Not unlike Angel, it is set in Northern Ireland during the Troubles, but unlike Angel, it is a much more conventional near-melodrama, which just might have something to say about the conflict. Cal (John Lynch, in his film debut –In The Name of the Father, Words Upon The Window Pane, The Secret of Roan Inish, Nothing Personal, Some Mother’s Son, This Is The Sea, Puckoon, Evelyn, Isolation and Five Day Shelter) is a perennially out-of-luck IRA volunteer, who becomes helplessly besotted with Marcella (Helen Mirren – Some Mother’s Son), the wife of a policeman that he had had a hand in killing. Cal and his father Shamie (Donal McCann - (Poitín, Angel, Budawanny, The Dead, December Bride and The Nephew) are the only Catholics in a Protestant housing development and are constantly under threat. And if that wasn’t enough, the local IRA commander Skeffington (John Kavanagh – Paddy, The Ballroom of Romance, Joyriders, Into The West, Circle of Friends, Some Mother’s Son, The Butcher Boy, Dancing At Lughnasa, Puckoon, The Tiger’s Tail and Closing the Ring) wants him to do a few more jobs and won’t take ‘no’ for an answer. Cal is a film that is seemingly obsessed with the suffering of the oppressed. Cal is always troubled and is frequently beaten up by bigoted thugs, the army and the police. Most of the other characters in the film do not come out well either, with one falling into a severe depression and another deep disappointment. O’Connor’s, and Mac Laverty’s, who adapts his own novel, vision of life during the Troubles is a bleak one, with a heavy focus on suffering, guilt and repentance. In one scene, a guilt-ridden Cal burns himself in the hand with a lit cigarette as atonement for the crime that he cannot tell Marcella about. There is also the figure of The Preacher (Tom Hickey – My Left Foot, Circle of Friends, The Butcher Boy, Inside I’m Dancing, Breakfast on Pluto, Garage, Alarm and Stella Days), who is often present to represent the question of faith and repentance. Ultimately, the film seems to suggest that the best response to the Troubles is self-harm and self-sacrifice, with more political or social avenues largely ignored. 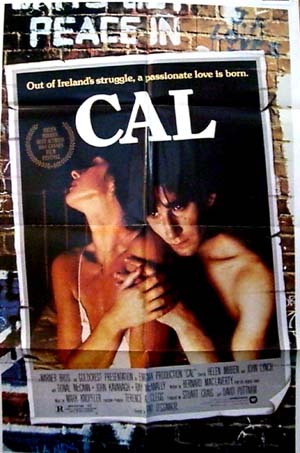 So, Cal does little to lift Northern Ireland out of the quagmire of the Troubles, but it is, nonetheless, a rather effective melodrama, despite an overdone story. Cal’s frequent flashbacks to that night may be overused, but the presentation of the drama (leisurely and muted, almost cold) and the quality of the performances, particularly McCann, whose downfall is the most tugging as he was the chirpiest, manage to make the film more than just a quiet moan. John Lynch plays the unfairly and too-frequently prosecuted man well, and would continue to play that role in In The Name of the Father and Nothing Personal. Helen Mirren does not have a huge amount to do, but when she does, she is convincing. The end of the film, though expected (who would ever have thought that it would all turn out well), is effective, the fade to the credits and their slow climb up the screen accompanied by some melancholic music quietly devastating in their own small way. Like Angel, Cal has little to say about the Troubles, a pity as both were, after all, opportunities to reach wide audiences and purvey a better message than that of the violence. However, unlike Angel, Cal has no pretensions to great art and, as a result, does not fall so far. A diverting and sometimes affecting melodrama, it is a much more fruitful starting point.